2018: [Letters to a Tree / Library of Walks] De Toren School Melsele Beveren Belgium ⋈ 19.03 > 11.06.2018 ⋈ [The Walking Body] Art department of the Minho University Guimaraes Portugal > 22.10.2018. 2017: [Urban Emptiness Network] 04.02.2017 Seminar speakers: Dr. Nikos Bubaris (Aegean University), Haris Pellapaisiotis (University of Nicosia), Dr. Yiannis Christidis (Cyprus University of Technology), Stefaan van Biesen (sound artist/ walking artist, Belgium), Marielys Burgos Melendez (dance artist/researcher, Puerto Rico) Via Skype: Dr. Christos Kakalis (Urban Emptiness Network organizer, University of Newcastle) and Stella Mygdali (Urban Emptiness Network organizer, University of Edinburgh) ⋈ [Becoming Invisible] 04>17.04.2016. Skype conference TAF & Metasitu, Athens Greece ⋈ [Urban Emptiness Network] Académie Royale des Beaux-Arts de Bruxelles 19.10.2017. 2015: [Spaziergangwissenschaft - White Walk-The Global City] 14.01.15 at RITS Brussels Belgium ⋈ [Nomads of a new era] the Milena principle (P41), public talk and performance videos by Geert Vermeire and Stefaan Van Biesen ⋈ B_Tour Festival] International Festival for Guided Tours ⋈ [04.06.2015] Leipzig Germany 2015 ⋈ [Water Carrier] Istituto Italiano di Cultura [23.10.2015] Athens Greece. 2014: [Water Carrier - for I am water now] 03.10.2014 - Museu Nogueira da Silva Braga Progtugal. 2011: [Alchemia] for Meg Stuart [Damaged Goods Dance Company] 07.01.2011 [as a research for her new dance production 'Violet'] Kaaitheater Brussels Belgium. ⋈ [the Milena principle] conference mediaroom CC Ter Vesten Beveren Belgium. 23.01.2011 ⋈ [(no) Tour] KASK Ghent Belgium [conference with Geert Vermeire, Enrique Tomas (Escoitar.org), Filip Van de Velde about the project for S.M.A.K.] 05.05.2011 ⋈ [the Milena principle] [conference with Geert Vermeire 'About' Art Centre Athens Greece] 27.05.2011 [for the Silence project the Academy of Fine Arts Athens Greece]. ⋈ [the Milena principle] Academia Danthesca Jahnishausen [conference with Geert Vermeire] Castle Jahnishausen Germany 04.06.2011 [Symposium 'Divina Commedia']. [the Dürer Connection & the Milena principle] video conference National Library 10 + 11.10.2011 Brasilia Brasil. [Social documentary Photography] lecture of the Milena principle during the international Festival Encontros da Imagem at the Museu Nogueira da Silva with students of the University of Minho Guimaraes-Braga, october 2011. 2010: [Landscape/Mindscape] Museo Noguiera da Silva Braga Portugal. 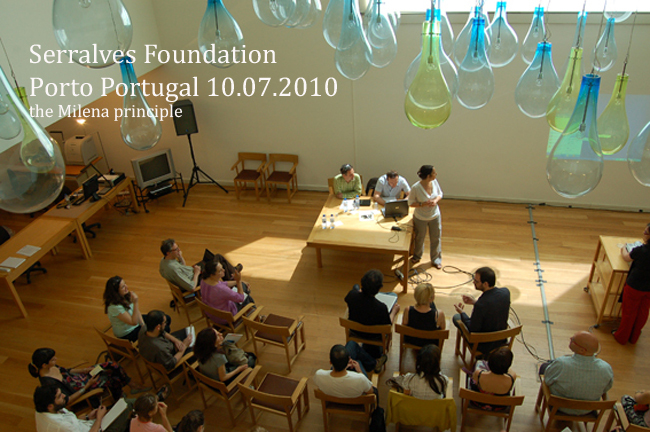 02.10.2010 ⋈ [the Milena principle in Europe] Serralves Foundation Porto Portugal 10.07.2010 [conference with Stephanie Brandt [Spacepilots], Geert Vermeire & Filip Van de Velde S.M.A.K.] ⋈ [the Milena principle in Europe] Show Me Gallery Braga [conference with Geert Vermeire & Filip Van de Velde] 13.07.2010 Portugal. ⋈ [Flyways - touching the void (II) + the Milena principle in Europe] Kunstpodium De Leegte Nieuwolda Groningen NL. 13.06.2010. 2009: [Joseph Beuys] SASK Sint-Niklaas Belgium. 2008: [A Boulanger] lecture ⋈ performance - 'Rewind' Vierkante Zaal SASK Sint-Niklaas Belgium. 2007: [the Milena principle] [presentation with Geert Vermeire & Filip Van de Velde] Art Academy of Sint-Niklaas Belgium. ⋈ [On the road] [conference with Geert Vermeire & Filip Van de Velde] Sint-Maarten Middenschool Beveren België. ⋈ [Komeling - to all new arrivals] [conference with Geert Vermeire, Jan De Wachter] Ghent Belgium. ⋈ [Gepäckträger - Luggage carrier] about the Milena principle [conference with Geert Vermeire] - Werkstatt 3000 Kassel Germany. 2005: [The nervated skin] [conference with Geert Vermeire & Filip Van de Velde] CC Ter Vesten Beveren Belgium. ⋈ [The philosphical path] [conference with Geert Vermeire] Friedrich Nietzsche Seminar Wielandgut Weimar Germany. ⋈ [A singing contest for speechless people] public speech Venice Italy. ⋈ [Art in the public library] [conference with Geert Vermeire & Filip Van de Velde] public library of Zwijndrecht Belgium. 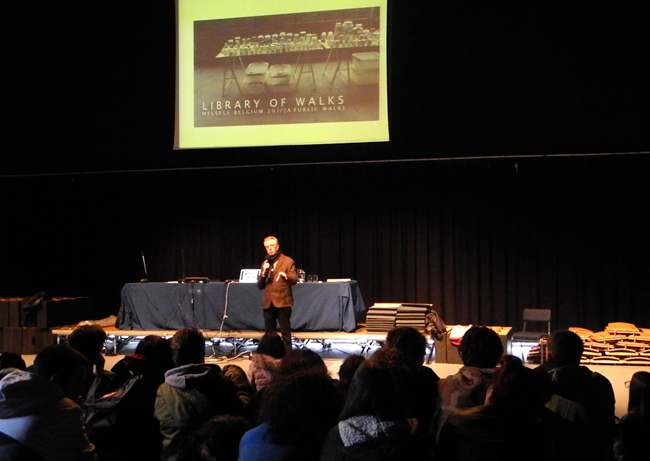 ⋈ [Letters to a landscape] [with Geert Vermeire] public library of Zwijndrecht Belgium. 2004: [There is a silence] letters [with Geert Vermeire] Het Vijfde Huis, Antwerp Belgium. 2003: [Aspects of geomancy and the landscape] Londerzeel Belgium.